Shooting and poisoning principal threats historically. Also egg collecting, nest destruction. Persecution: the principal factor leading to the extinction of sea eagles in Ireland as well as several other countries. During the 19th century, eagles and other birds of prey were heavily persecuted on large estates by gamekeepers. Adults could be relatively easily shot at the nest while the nest itself could also be destroyed. Eggs and skins of eagles were also greatly prized as collectors items. Strychnine, used as a poison bait for foxes and other animals, had a devastating effect on all scavenger populations but especially eagles as population viability is heavily dependent on low adult mortality in these species. The use of (legal and illegal) poison meat baits remains problematic today in parts of the sea eagle’s range. The prevalence of ravens and the range expansion of Common Buzzards in Ireland suggest that the use of poisons may not be a limiting factor to the reintroduction of eagles. The recent poisoning of a newly-released Red Kite in Leitrim in 2007 suggests however that poisons remain a threat. Environmental Contaminants: DDE (the breakdown product of DDT) had catastrophic effects on raptor populations throughout Europe and North America resulting in widespread decline to extinction or near extinction of Peregrine Falcon populations. DDT, in widespread use as a pesticide in the 1950s and 60s, accumulated in the bodies of birds at the top of food chains causing reproductive effects, principally eggshell thinning. Raptors laying thin-shelled eggs experienced very low hatching success due to egg breakage and embryo death. Another organochlorine group called PCBs (commonly used in plastics) also accumulates through the food chain with detrimental effects on embryos and possibly other sub-lethal effects. Sea eagle populations along the Baltic Sea in Europe were greatly affected by DDT but have recovered well since DDT and PCBs were banned in western Europe in the 1970s. However, PCB levels continue to remain high in many parts of the world while many new organochlorines enter aquatic ecosystems annually. Lead Poisoning: Sea eagles and other large scavengers suffer poisoning due to lead ingested in gunshot and bullet fragments from eating wounded or hunter-killed animals. Lead toxicity has been the principal cause in the decline to near extinction of the California Condor and continues to threaten recovery efforts. More than a quarter of sea eagle specimens examined (28%) in a study in Germany and Austria had apparently died due to lead poisoning. Lead will continue to be a mortality factor for sea eagles until replaced with lead-free ammunition. Collision and Electrocution: Collisions with overhead powerlines as well as trains are a significant source of mortality for sea eagles in central and northern Europe, some 30% of deaths of specimens examined in Germany and 40% in Sweden. Collisions and electrocution accounted for some 71% of mortalities of 1st year birds in Norway. 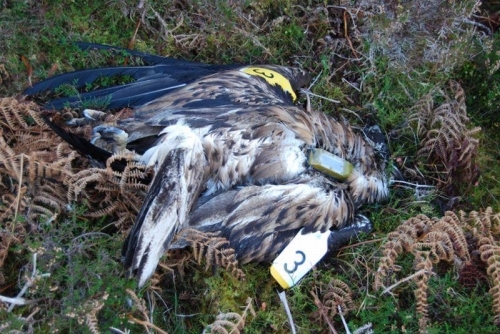 Two newly released sea eagles died from electrocution in east Scotland in 2007. The growing prevalence of wind farms, especially in coastal areas where high densities of sea eagles occur, is also likely to become an important mortality factor although effects at the population level are yet to be determined. Twelve sea eagles have died due to collisions with wind turbines on the island of Smøla, Norway, within the past two years, where pairs have nested as close as 32m to turbines. In Kerry most of the coast remains off-limits for wind farms for scenic reasons (Kerry County Council Management Plan).